I bought three plane tickets recently, to come back to Britain to see family for Christmas, on the way back here I am stopping for a short break in Basel, Switzerland to spend New Year with my friend Matthias who lives there, I am going to do some travelling and fly out of Geneva back to Tel Aviv. 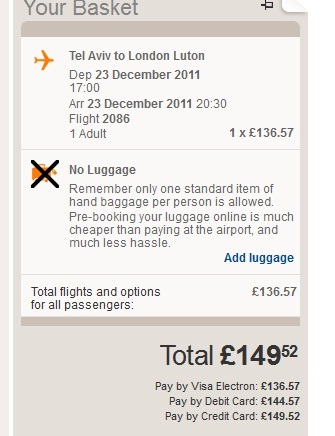 I really don’t like airlines for their dishonest practices with upselling you things that used to be included. This booking I did here was an extra £13 to use a credit card or £8 using a debit card! I bet you if you bought a chocolate bar with a credit card in Tescos they couldn’t care less!